With the right training program and a balanced and nutritious diet, you could have abs like this when summer comes around. As summer approaches, men worldwide want to know what it takes to lose their excess belly fat. Specifically, they want to know how to get a six pack of abs! They want to know how to look good during the summer months when going shirtless is almost a necessity. This is usually because they have “let themselves go” a little over the winter months but not always. The problem is that these guys often leave it too late. What you need to do if you are in this situation is plan ahead. Ever heard of the 7 P’s? Proper Preparation and Planning Prevents Piss Poor Performance! This military adage is spot on….if you are serious about looking good for summer, you need to start early. Will doing lots of crunches help you get a six pack? NO…lots of crunches won’t help….especially if you have extra padding around your midriff as well. You could have a great set of abs but if they are covered by a layer of fat, nobody is going to see them and it’s proven that spot reduction (targeting one area for fat loss) does not work! So…to get yourself ripped in time for summer you will need a full body workout routine that will take care of any excess body fat that you have while building and sculpting your muscles….abs included! Losing weight without a combination of diet and exercise is pretty much impossible. To lose weight quickly AND efficiently you need muscle because muscle is metabolically expensive. What this means is that it takes a lot of calories to fuel muscle. In fact, it takes between 50 to 100 calories a day to fuel just 1 pound (453 grams) of muscle and it makes no difference whether you are male or female. This means that if you added a mere 5 pounds (2.2 KG) of muscle to your frame, you would be burning between 7500 and 15000 extra calories per month which equates to about 2 pounds (907 grams). This might not seem like a lot but to put it in perspective, if you are on a treadmill for 45 minutes you will only burn 195 calories! Add to that the 105 calories that you burn “at rest” in 45 minutes and you get a grand total of 300 calories! That means that to burn the same amount of calories per month as adding 5 pounds of muscle would do, you would need to be on that treadmill for 1 and a half HOURS for 25 days of the month! Muscle burns a lot more fat which is why you need a strength training program that will the build muscle that in turn will burn the fat. 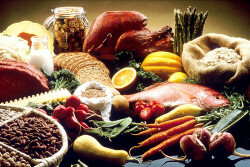 Combine the strength training program with sensible eating habits and you will reach your goals easily. Ok, so what sort of training program should you do? Doing weights is an option as it is a well known fact that lifting weights will build muscle BUT in my opinion, weights are no match for bodyweight exercises. Most people don’t know this but you can make bodyweight exercises so intense that most weight room strongmen couldn’t do 1 rep! 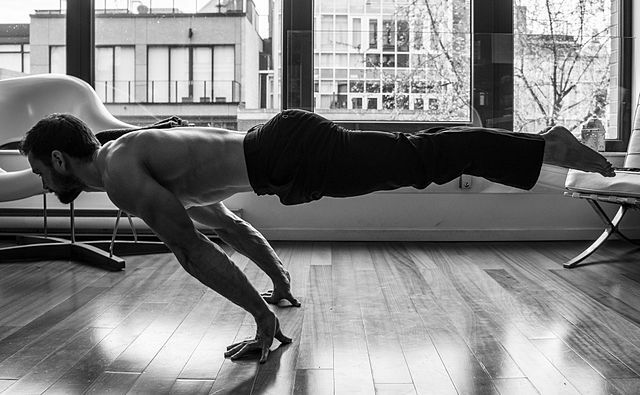 The Planche pose requires a combination of incredible strength and balance. Even more so when you start doing Planche Push Ups! That is why I like Calisthenics (bodyweight training) so much. Done right, you can make huge gains. Not only in muscle growth but what I call functional strength. Now, modern Calisthenics programs usually incorporate high repetition, low intensity exercises. The reason…to slim down. If you have not trained regularly for some time and are just getting back into fitness, training in this fashion WILL enable you to lose some body fat and you will build some muscle. BUT…because you are doing lots of reps, you are building endurance not strength. As a result, the muscles are not as strong or as big as they could be. This means that you burn less fat. This is NOT what you want….certainly not in the beginning. A program like this would be good for getting the definition you want towards the end of the training cycle. Also, these high repetitions often led to injury on beginners because there body isn’t used to the volume (number) of reps.
What you want is a low repetition, high intensity bodyweight program that focuses on building muscle. What programs are out there and are there any “stand out” programs? The YAYOG DVD workout series by Mark Lauren are brilliant and I highly recommend them. There are thousands of programs out there and some are better than others. If you need to be motivated, training alongside a coach is a good idea however this costs a lot of coin…unless you follow a workout DVD series or something similar. This is a good option as it’s cheaper than getting a trainer and you can do it at home. The DVDs also give you the opportunity to see how to do the exercises properly and with good form. There are several of these but one that I have used and really like is You Are Your Own Gym (YAYOG) by Mark Lauren. With YAYOG there is a book, a DVD series, and an absolute gem of an app for smartphone users. The book makes for good reading and the DVD series is valuable as you can follow along with Mark as he trains which is great. The app though is awesome! Each exercise is shown in detail with videos and written descriptions. The workout programs from the YAYOG book are included and a warm up and cool down is also included. As you progress through each workout, a video snippet of the exercise you are currently on plays, showing you correct form. In effect, it’s a lot like training alongside Mark. Oh and last time I checked it only cost about $3.49 so you have NO EXCUSES! It is available on iTunes and Google Play. There are good programs out there that are only in book format. Convict Conditioning and Convict Conditioning 2 spring to mind as two of the best. The Convict Conditioning program will make you strong as an Ox and both books are great reads. The downside if you are a visual learner is that there is no workout DVDs to follow. There are instructional DVDs that you can buy but they are expensive. Al Kavadlo has produced some great books on Calisthenics training as well but like the Convict Conditioning series, there is no workout DVD series yet or an app that you can follow along to….not yet anyway. I hope he does produce one as he is a great trainer who doesn’t take himself to seriously. His most notable training books are Raising The Bar and Pushing The Limits. Both are very good and go into great detail about each of the exercise progressions. They also offer training guides at the back for each skill level but unfortunately these guides are not “in depth” like the rest of the books. Of the lot, my pick of those outlined above would be the YAYOG series, but there are others out there if you want to look for them. I won’t vouch for something that I don’t believe in or haven’t tried so when I say that the YAYOG program is top shelf…I mean it! “Eating Clean” means eating “fresh”. This will ensure that you avoid additives and synthetic preservatives. Although building muscle is important to developing the physique that you want, it is not as important as nutrition. You could have an awesome six pack but if there is a layer of fat covering them, nobody will see them. So…you need to avoid processed foods like the plague and start eating “clean”. By this I mean start eating only fresh fruit and veges, and lean cuts of meat. No more canned crap or fast food. These things will set you back big time. If you eat “clean” you won’t have to worry about counting calories or any of that drama either. Just be mindful of your portions….as you can still eat “too much” of the good stuff. In saying that, you also want to make sure that you don’t let your body get hungry. To avoid this, spread out your meals and supplements throughout the day into 5 or 6 smaller meals. Tea: Pork steak with a large salad and some steamed vegetables. I’m not a small guy at 6′ 6″ tall and 230+ pounds yet eating like this keeps me fuelled and satisfied so you shouldn’t have an issue. Eating in this fashion, together with an effective bodyweight strength training routine pretty much guarantees that you will the results you want (as long as you don’t cheat). Avoiding alcohol will help to so if you can avoid it, do so. Beer will make you fat so give it up! Avoid alcohol in general if you can but you can have top shelf liquor as a treat. Hold your horses! Don’t be so dramatic…just hear me out. If you are serious about getting into shape and getting a six pack, you will have to refrain from drinking alcohol regularly….especially beer! 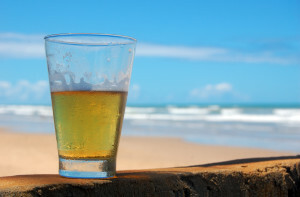 Now…I’m no Saint and I am quite partial to a drink or two myself, therefore what I’m saying is that you don’t have to give alcohol up entirely, just that reducing your intake will help significantly, and avoiding beer is almost a must. If you are going to have a couple of drinks “on occasion”, stick to the top shelf and avoid the beer. Vodka and Gin are good alternatives. You should drink them straight or put them in freshly squeezed orange juice (not the sugar filled “from concentrate” crap). If you can adhere to the advice I have shared with you today, I guarantee that you will reach your fitness goals, whether they be to lose belly fat, get stronger, or get ripped. I really enjoyed writing this article about how to get a six pack of abs for summer, and I hope that you have found it informative and helpful. Feel free to leave me a comment or sign up to our newsletter below. Hi Jeremy, that´s a great post, thinks there´s a lot of good advice for women to get into shape too, thanks! Its true that a lot of women avoid strength training because they think they will develop huge, ugly muscles. This is not the case with Calisthenics so I’m glad you now understand this. I hope to see you back here soon. Back in college I trained every other day and incorporated much of what you laid out here except not as heavy on the calisthenics part. I got big then ripped as my muscle mass began to eat the fat super fast. Another thing I like here is that abs are made by eating right as well. Thanks for your comments. I’m a huge believer in Calisthenics (if done right) which is why I’m obviously so passionate about it. However, I know that some people prefer weights (like you) and that fine to. It just depends on what your goals are. I’m glad you liked the nutritional advice…and you are spot on…its vital if you want to really define those abs. that is some clean advise that you give here. A lot of people just doing it wrong and training only there abs like hell. Glad that there are some side like yours, that really want people to understand how this works in reality. I’m glad you liked the article and found the advice useful….and yes you are right, I do want people to understand how to improve themselves and how to achieve their fitness goal. To do so, they need quality information so I do my best to make sure they get it. Take care and I hope to see you back here soon. Top article Jeremy …like your clear and informal writing style …just like I am in the room and you are talking to me …makes the article easy to read and you have lots of great information and advice in there. Thanks for the feedback. I really appreciate it. Its great to know that you found that my writing style put you at ease somewhat…especially when my goal is to help and instruct people, not boggle their minds with irrelevant information. Glad you liked it. I hope you come back soon.